This week: $5 million for African lamps, the new World Trade Center's light show, and GaAs grown on graphene. Researchers from the Norwegian University of Science and Technology, Trondheim, have developed a process for growing gallium arsenide wires on graphene by molecular beam epitaxy (MBE). Here is their paper in Nature. They have spun off a company, CrayoNano AS, to commercialize the process. This development came out of earlier work in manipulating the crystal structure of GaSa and other semiconductor materials as they were built up by MBE. The use of one-atom-thick graphene as a substrate, in place of the more common silicon (which is millions of times thicker), points to the possibility that, over time, graphene could replace silicon as a component in electronic circuits. Additionally, the graphene process could find application both in LEDs and in photodetectors for solar cells. CrayoNano is already beginning experiments with growing GaN crystals on graphene. This isn't refereed and published work -- it was presented as a poster at the American Institute of Chemical Engineers conference -- but it is of interest in alleviating concerns about the long-term health effects of LED lighting. A group of chemical engineering undergraduates at Stony Brook University developed a senior thesis, "The Effects of Color LED exposure on Human Dermal Fibroblast Proliferation, Mitochondrial Activity and Cell Morphology." The team worked under Miriam Rafailovich, Distinguished Professor of Materials Science & Engineering, exposing fibroblast cultures to red, green, blue, and white LED light. The exposures varied in duration to equalize the power delivered to the specimens by the different frequencies of light. The team found no evidence that the light was harmful to human skin cells. In fact, the students found some indications that it could be beneficial in healing wounds. The foundation started by the former New York mayor has agreed to put the money into the European social enterprise Little Sun. The project is an artfully designed, hand-portable solar lamp. Four hours' exposure to sunlight gives five three hours of LED light. 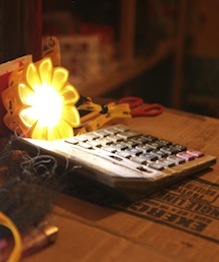 The Little Sun is in use in seven countries in sub-Saharan Africa. Bloomberg's commitment marks the first time the foundation has invested for social good, not just for increase of capital. See the related posts below for more of our coverage of LED lights for Africa. Most of them (unsurprisingly) are solar-powered. We have written several times about the Empire State Building's LED light shows (see related posts), as well as the lighting of the spire at 1WTC. Now it seems that the new tallest building in the Western Hemisphere doesn't want to be left out of the light-show buzz. Or perhaps its resident digital-media artist, Mark Domino, doesn't want to come second to the ESB's Marc Brickman. "Domino has real-time control over the lighting program via his phone, though he says he doesn't know whether management will let him use this custom-built software when 1WTC opens later this year," Wired reports. That sounds like a pretty casual arrangement compared to the ESB's elaborate choreographed shows synched to music broadcast over local radio stations.